A place that’s far away from the hustle and bustle of everyday life — a place that isn’t ringing or talking or roaring or blaring or playing. But sometimes that place isn’t easy to find. You could look under a bush in your own backyard, where the world seems far away…and you could be a pirate on a desert island. Perhaps the very best quiet place of all — the one that’s inside of you. In poetic and gently philosophical prose, acclaimed author Douglas Wood explores what it’s like to find that special place where we all can think our own thoughts and feel our own feelings. 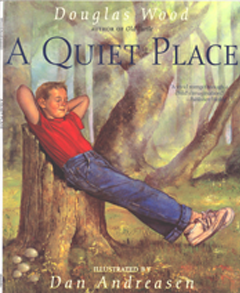 Dan Andreasen brings exquisite imagination and thoughtful wonder to words that will inspire readers of all ages to seek out their very own quiet place.